Happy New Year, y'all! Can you believe how fast this past year has went by? I've heard it said that the older you get, the quicker it goes and I believe it! I have been digging around trying to find some New Year's traditions and superstitions to share with you and only a couple of them were familiar to me with the most familiar being the tradition of eating black eyed peas, greens, and pork for the first meal of the new year. I have practiced this tradition for as long as I can remember. My Granny Janice ALWAYS made this for our New Year's supper but would add coleslaw (I wouldn't eat greens when I was younger), stewed taters, & cornbread. Come to find out, there is a story behind this southern tradition. During the Civil War, the Northern army would come in and take anything they could carry and eat anything they could eat. This included livestock and any grains they could use to feed them...but they couldn't take it all. After the smoke cleared, the remaining southerners weren't sure how they were going to avoid starvation. Luckily for them, Sherman's troops had left silos filled with black eyed peas. At that time, the North only used black eyed peas as feed for livestock. The Northern troops saw it as the thing of least value and since they had taken all of the livestock, what use would it be to the southerners? They didn't realize they were leaving the very thing that would keep the southerners from starving. 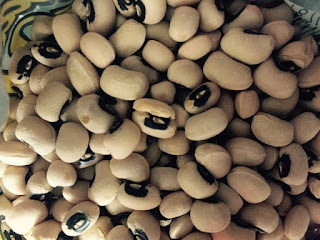 From New Year's Day 1866 until now, the tradition of eating black eyed peas for luck continues. We always ate greens because they were said to represent wealth for the new year. The more greens you ate, the more green you'd have in your wallet. I'm still not sure there's any truth behind this but at this point, I'm not willing to chance it! Pork is said to represent looking and moving forward to the year ahead because pigs can't turn their head from side to side. This is the only one of the trio that I never knew! Immigrants from Wales believed that spreading ashes over the hearth on New Year's Eve could predict events for the upcoming year. If footprints left in the ashes headed towards the front door, someone would die. If the footprints went into a bedroom, there would be a new family member in the home. The shape of a coffin in the ashes predicted death and the shape of a ring foretold a marriage. If a girl would like to know who she will marry, she can throw a ball of yarn out of her bedroom window at midnight on New Year's Eve, and say, "As I wind he comes" over and over as she begins winding the yarn back into a ball. If she is to marry, her future husband will hand the yarn back through the window to her. If no one appears, she will not marry. It is bad luck to hang up a new calendar before the first day of the new year. If there is no food in the pantry on New Year's Day, it is destined to remain empty the whole year. Well water is said to turn to wine at midnight on New Year's Eve. If a man enters your home first on New Year's Day, it is a sign that you'll have good luck all year. If it's a woman, the opposite is true. I hope you have enjoyed these traditions and superstitions and I would love to hear any that you know. Please share them in the comment section down below and I hope each of you have a blessed New Year!